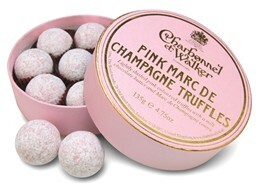 With a heritage as fine as the dusting on their hand made truffles Charbonnel et Walker were one of Britain's first chocolatiers. Esteemed by Edward VII, they are endorsed by the Royal Warrant and have enjoyed the enduring patronage of royalty and socialites since 1875. Yet a box of these heavenly delights will not break the bank. Far from it. There are any number of goodies in their Mayfair shop but for me there is nothing more tempting than these tantalising treats, which are my "go to" truffles for personal indulgence and dinner host gifts. Hats off to Mrs Walker and Mme Charbonnel; it cannot have been easy to be businesswomen in the nineteenth century, think about it!